Hotel Livikon is beautifully situated in the heart of the small harbour village of Chora Sfakion with magnificent views over the sea. The 10 rooms have recently been fully renovated. Rooms sleep 2, 3 and 4 persons. 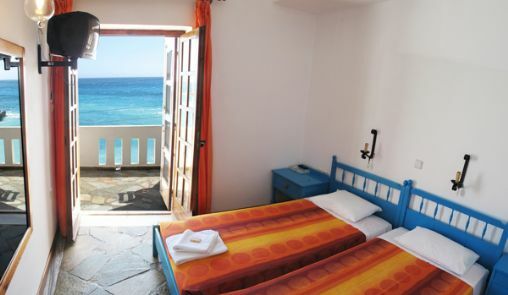 All rooms have a balcony which overlooks the sea, an attached bathroom and a choice of double or twin beds. Breakfast is available at a small extra charge (coffee or juice, bread, butter and jam). Air-conditioning is available for a small daily charge. Discounts are available for stays of 7 days and over. Please email or phone for room availability or visit us to enquire about available rooms if you're already touring the area.